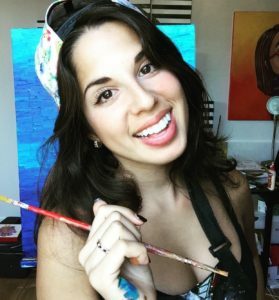 Jennifer Gardner interviews Amanda Oleander on her work, becoming a live streaming sensation on Periscope with over 500,000 followers, her love for supporting animals through her art, and the importance of following your passions. Amanda Oleander is a Los Angeles based fine artist. Oleander's artwork became internationally recognized after working for E! Entertainment as their first in-house full time illustrator illustrating for their articles in 2014. In 2015 Oleander became a full-time at home artist. She started to paint live from home and broadcast her work on a live streaming app, Periscope. Oleander's art became viral after she gained a following of over half a million followers and attention in the media. She has been featured in The New York Times, Seventeen, Cosmopolitan, Vanity Fair, and The Hollywood Reporter to name a few. Shortly after she signed with United Talent Agency. (2:00) Being an early adopter on Periscope, didn’t know what live streaming was, top woman on the app in the first week and it all started by reading The Giving Tree by Shel Silverstein from her couch painted like the cover of the book. (8:00) Amanda’s big break working for E! Entertainment as an illustrator and how streaming on Periscope has helped her art become more widely known and sold internationally, building community, partnering with World Wildlife Fund and Greenpeace and her Endangered Species Collection. (13:00) Her work as a full-time artist, her background & what a typical day looks like for her. (15:15) Amanda’s forthcoming illustrated book coming out about true love and line of greeting cards for the LGBT community. (16:15) The media attention Amanda received in the early days of Periscope and why she thinks so many people are watching. (20:00) Shifting from working at E! to becoming a full-time independent artist, how taking a risk on an internship brought her from Florida to LA. (24:00) What makes Amanda feel the most alive? (25:00) Discovering her love for art and drawing as child at Disney World, the support of her parents growing up, her detour in college when she though she would major in business. (27:20) How Amanda had to overcome the challenge of moving away from family to pursue her art, the importance of saving money if you want to be an entrepreneur, and the people who have really helped her along the way, including the friend who originally suggested she check out Periscope! (31:20) Helping people, being generous, and supporting other artists. (32:45) The role of mindfulness, meditation, and nature in Amanda's life and work, and being in the zone when painting. (35:00) Amanda's positive outlook and view for the future. You can connect with me on Facebook, @jenbgardner on Twitter, or you can email me here. I am also on the web at www.jgardnerassociates.com and you can read about my approach to practicing law. A lot of people have approached me with questions on equipment, resources, and more. So, I've picked my top two items for you that I think will take your podcasting experience to the next level. Enjoy!